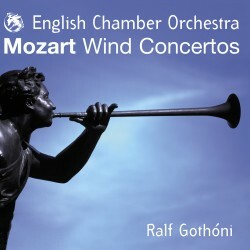 The celebrated English Chamber Orchestra releases the first recording under their Principal Conductor, Ralf Gothóni, at the same time casting a spotlight on the artistry of the ensemble’s solo wind players. Mozart’s masterful concertos find oboist John Anderson, clarinetist Anthony Pike, bassoonist Julie Price and horn player Richard Perry in top form. With John Thurgood stepping in for the delightful Sinfonia Concertante, the four players splendidly showcase their style and virtuosity. Now in their fifth decade, the English Chamber Orchestra has attracted the world’s finest musicians over the years, including conductors Benjamin Britten and Sir Colin Davis, violinists Nigel Kennedy and Maxim Vengerov, percussionist Evelyn Glennie and many more. Mozart figures prominently in their distinguished discography, including three complete cycles of the Piano Concertos (with Barenboim, Perahia and Uchida) and the complete Symphonies with Jeffrey Tate.